Other considerations in your conversion. This is a system which converts from a seat bench into a flat small double bed. Up until this year these seats where not crash tested in the way that all factory fitted car seats are. It is now possible to get properly certificated crash tested rock and roll seats but they are expensive. If you go for non-certificated ones then you are not allowed to carry passengers in them. Older conversions will usually have non-crash tested versions, but as the conversion was performed prior to the rule changes you are allowed to carry passengers in them (although I would want proof of the date of conversion). Older rock and roll beds did not have headrests, another safety consideration. 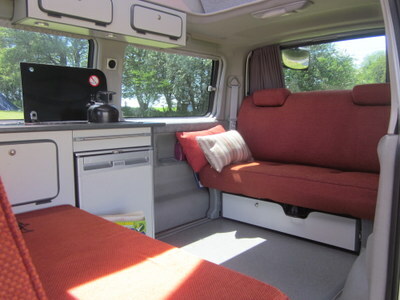 It is possible to retain the original seats, which conform to safety standards with 2 sets of 3 point seat belts, one centre lap belt and headrests. They will lie down flat to form a bed, this was the original concept of the vehicle. However, they are contoured as car seats are and can feel a little lumpy to sleep on. If you find this a problem, one solution is to have them re-upholstered. As long as the original frame and seat belts are unaltered, the seats will be just as safe for travelling in, but more comfy for sleeping on! Prices vary but we had ours done for £500 by a vehicle upholstering firm. Not cheap, but much cheaper than a certified rock and roll bed (approx £1200 +). Many people go for a memory foam mattress topper to smooth out the bumps. This works, but you then have an enormous mattress topper to store. Leisure battery – you will need one with a conversion, it allows you to run things like your fridge and lights without worrying that th engine won’t start because of a flat battery. Your converter will re-wire your supplementary electrics to the leisure battery. External hookup – allows you to plug your car in to charge the batteries – we mainly use ours at home to ensure a good charge. We had it hidden underneath to avoid the need for a plastic flap on the side of the van (and possible future rust). Gets a bit muddy but not an issue. Water – you can get conversion with both clean water and dirty water storage. We went for a conversion that has an outlet under the car so no water capture. We have not had an issue with this but some sites may not like it in which case you can put a collection container underneath. Our conversion was by Clearcut Conversions in Barnstaple. We have beenvery happy with their work! Could you tell me where you got your seats re-upholstered?